Last week I contacted Tery Cox (see www.coxrail.com) with a possible new certificate. 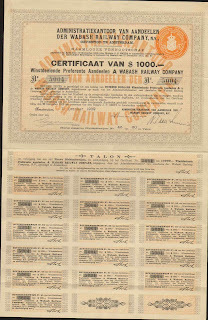 Company is known as the Wabash Railway Co NV, Administratiekantoor van Aandeelen der. The new certificate was previously unlisted in the database. It's a certificate for prefered stock showing two serial numbers. Terry confirmed that this is indeed a new variety. It's now listed as WAB-089b-O-12b and should appear in the database update of august 15th. Below is the picture of this new certificate. I have a few of these certificates for sale. Please contact me when interested.